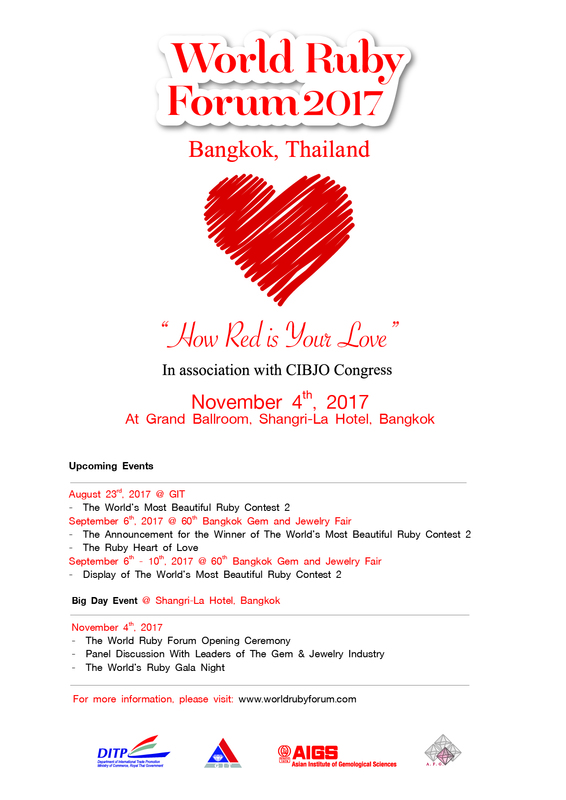 Organizers of the second World Ruby Forum announced that the next event will be held November 4th at the Shangri-La hotel, in conjunction with the 2017 CIBJO Congress taking place in Bangkok. This will follow on from the conference's successful first iteration, which took place at the 59th Bangkok Gems and Jewelry Fair back in February. The event will be held one day before the opening of the CIBJO Congress, and will again represent a coming together of the most prominent figures with regards to ruby-based extraction, enhancement, cutting, jewelry design, jewelry manufacture, laboratory testing, marketing and sales. Whether it be via lectures or poster presentations, we encourage all interested parties to attend and share their ideas, opinions and experiences - especially those relating to source locality - for the benefit of all whose livelihoods revolve around the "King of Gems". The organizing committee is made up of delegates from the Gem and Jewelry Institute of Thailand (GIT), the Thai Department of International Trade Promotion, Ministry of Commerce (DITP), the Asian Institute of Gemological Sciences (AIGS) and the Association Française de Gemmologie (AFG).